Fusion energy production in ITER requires the achievement of high pressure plasmas in high energy confinement mode (H-mode). This confinement mode is characterized by the formation of very steep plasma pressure profiles at the edge of the plasma that lead to periodic bursts of energy being expelled by the plasma (typically a small percentage of the total plasma energy) called ELMs (Edge Localized Modes). Although ELMs have no impact for the vacuum vessel, due to the large plasma energy of ITER plasmas the energy bursts caused by ELMs can lead to an accelerated erosion of the divertor and first wall components in contact with the plasma. This could lead to a more frequent replacement than foreseen in ITER. In addition, the eroded atoms can penetrate and contaminate the plasma thus decreasing the energy production. ELM control is required for the achievement of fusion energy in ITER. Two schemes are foreseen to minimize the impact of ELMs—pellet injection and in-vessel ELM control coils. Understanding the magnitude and structure of the ELM energy bursts and quantifying the effectiveness of ELM control schemes is an active field of research where significant progress has taken place recently. Simulations of ELMs in ITER with the non-linear code JOREK have shown that there are two mechanisms for the flow of energy from the plasma to the components in contact with the plasma during ELMs (see image above): one is the loss of energy by the plasma in the strongly perturbed edge magnetic field during the ELM (conductive losses); the other is the expulsion of plasma filaments (analogous to solar flares) which move radially away from the plasma towards the wall. JOREK simulations show that for small ELM energy losses the dominant mechanism is the expulsion of filaments and that this energy is deposited over a large area of the divertor and wall. This allows more room for ELM control in ITER than originally anticipated. Progress on ELM characterization and ELM control has also come from the experimental side. ELM avoidance using 3-D field magnetic field perturbations, which will be provided in ITER by a set of 27 in-vessel coils, has now been achieved in a large number of experimental devices. Results span the range of densities and collisionalities expected at the ITER plasma edge, although ITER values cannot be achieved for both parameters simultaneously (these can only be achieved in ITER itself). While understanding of the detailed physics processes that lead to the avoidance of ELMs with 3-D magnetic field perturbations remains elusive, ELM avoidance using this scheme has now been observed in numerous experimental devices. This increases our confidence in the viability of this ELM control scheme for ITER. Recently, there have also been major advances on the second ELM control scheme foreseen for ITER, which utilizes the controlled triggering of the ELM bursts by the injection of small frozen deuterium pellets. Experiments in the DIII-D tokamak in which very small pellets were injected have demonstrated for the first time that this technique can be used to increase the frequency of the ELM bursts, and to decrease the magnitude of the fluxes that they deposit, by more than a factor of ten (a factor of 30 may be required in ITER). In these experiments, detrimental effects on the plasma energy confinement were modest. This is a major advance from previous results in JET, ASDEX-Upgrade and DIII-D, where factors of only 2-5 were achieved in ELM frequency, but, in some cases, with noticeable detrimental effects on plasma energy confinement. The DIII-D experimental results have been reproduced with the JOREK code, which has subsequently been applied to evaluate the pellet characteristics (size and velocity of injection) required in ITER to achieve controlled triggering of ELMs (see image at left). The JOREK results show that these requirements are met with the specifications foreseen for the ITER pellet injection system and pellet injection geometry. The associated fuel reprocessing requirements are also consistent with the specifications of the ITER tritium reprocessing plant. 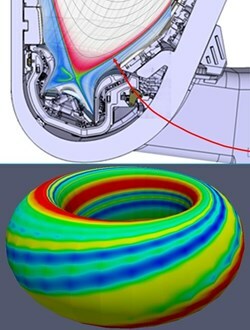 Although uncertainties remain regarding ELMs and the application of the ELM control schemes to ITER, recent progress in this area has substantially increased our confidence that ITER is equipped with the appropriate tools to achieve the ELM control level required for the achievement of significant fusion energy production.